Fido’s Flea Shampoo is an innovative formulation that comes in body wash form for treating fleas and lice on dogs and cats. This special shampoo along with cleansing eliminates fleas and produces a soft lustrous coat. Its non irritant effect is gentle on sensitive pet skin and leaves pet refreshing and smelling pleasant. Fido’s Flea Shampoo contains natural pyrethrins that have natural cholinesterase activity. It acts on insect by slowly deactivating its sodium channel leading to hyperexcitation followed by convulsion and death. This ingredient is slightly compounded with piperonyl butoxide which offers repellant action and prevents flea attack. With warm water wet pet’s coat properly. Apply Fido’s Flea Shampoo at several places. Massage gently with sponge and work up to form lather. Leave for 5 minutes and then rinse with clean warm water and dry thoroughly. 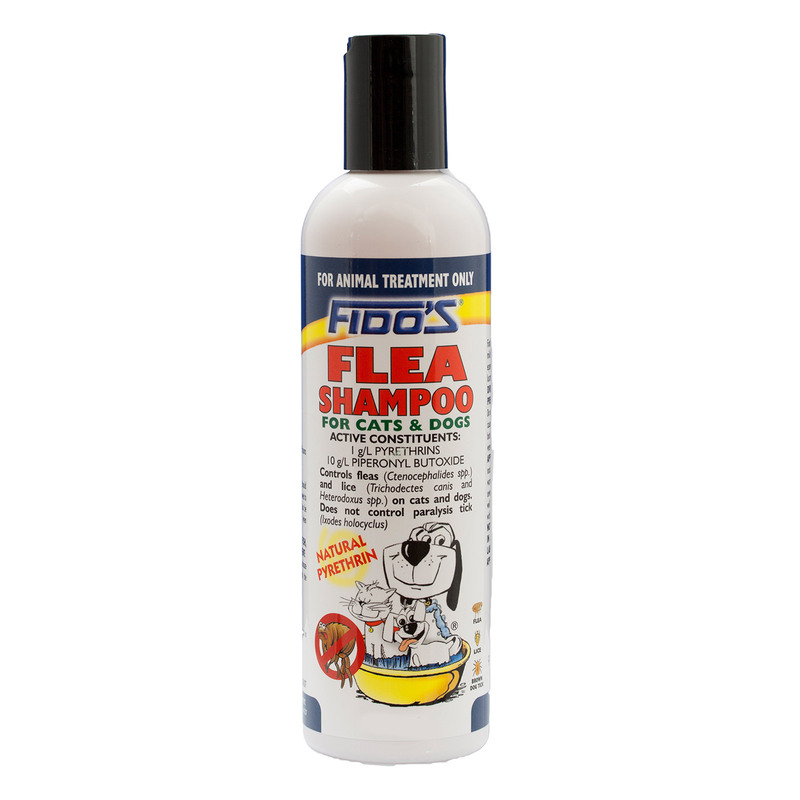 Fido’s Flea Shampoo is an advanced formula for treating fleas and lice on dogs and cats. It kills fleas and lice apart from cleaning pet coat. It removes flea dirt and grease leaving skin and coat clean and fresh. It smooths skin and eliminates animal body odour. Store it below 30 degree Celsius (room temperature). In paralysis tick areas, daily examine your dogs or cats is preferable. Do not use in sick or convalescing pets. I have been using this product on my dog since two months and I can definitely say it has improved his fur texture amazingly. My doggy was suffering from fleas and lice since last few weeks. I tried every flea preventive treatment but nothing worked. In the end, one of my friends suggested me to try this product. The great thing is that now my furry pal is free from fleas and lice. It is pleasant on the skin and leaves a refreshing fragrance. Thank you!!! Found Fidos flea shampoo easy to use & effective also has a nice smell.